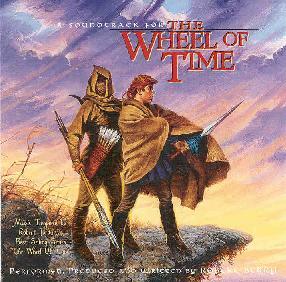 Robert Berry - "A Soundtrack for The Wheel Of Time"
Robert Jordan's The Wheel of Time is without a doubt the most popular epic fantasy series since J.R.R. Tolkien's Lord of the Rings. This soundtrack was composed with the author's permission. Robert Berry is a veteran musician and producer who has worked with artists such as Keith Emerson and Carl Palmer. I would not have guessed a person of his background would be the ideal choice to breathe musical life into Jordan's world, but he has done a fantastic job. The music, production, and even artwork leaves little to be desired. Magna Carta has commissioned Darrell K. Sweet to paint an original cover along the lines of his artwork for the series itself. The music keeps a safe distance from the commercial pitfall of turning the project into a hokey, pseudo-medieval catastrophe. Berry chooses to take a modern approach with his reliance on percussion, guitar, and synthesizer. Having said that, I must stress that he has captured the spirit of the series and its world while avoiding the artificial aura that he could have been trapped into. I cannot imagine a better soundtrack for the series without the use of a full symphony orchestra. The mood of the music ranges from the grandiose movie score that most fans would demand to subtle themes that explore every-day emotions. That variation keeps the music fresh throughout the length of the CD. We get undulating percussion accompanied with tense string arrangements and dark choirs to simulate battle sequences. Majestic fanfares give way to calming woodwinds that recall long journeys and starry nights. Berry brings in violin and mandolin to lend an acoustic dimension to these synth arrangements. The guitar work encompasses acoustic melodies and fiery rock sequences alike. I particularly enjoyed the chanting on tracks such as "The Aiel Approach." Apart from that, only two of the nineteen tracks feature vocals. At first I was unsure about those vocals because they are typical highly-accessible songs sung in English unlike the fabricated chants used on the last track. Berry's musical background bleeds through on these tracks because they stand out as a product of this world rather than totally immeI think the vast majority of Jordan's rabid and scrutinizing fans will consider this a worthy soundtrack for their beloved series. I would recommend this release to them as well as AI's reading public. The music could easily stand on its own and compete with the vast majority good releases being produced today. The only drawback is that the songs are short, straightforward, and not intensely involved or layered. Then again, that's not what a soundtrack is meant to be.